On the 11th of November, two collaborators of the UNESCO Chair, Ing. 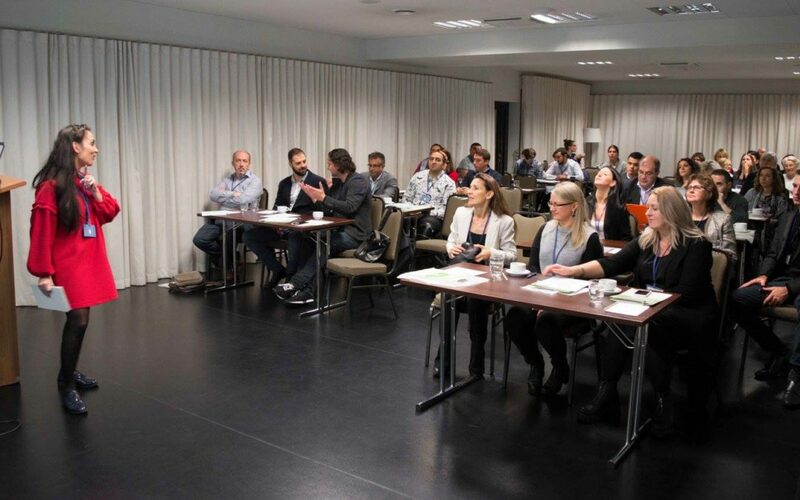 Kevin Ramirez and Serena Montefusco participated to the third EUROSOL event in Vilnius, Lithuania. 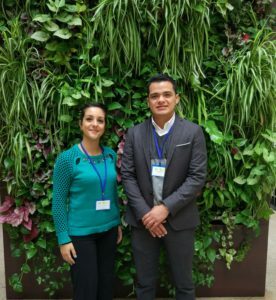 Vilnius Business College, one of the seven partners of EUROSOL project co-funded by the European Union, organized a conference, Active Society – Innovative Solutions (ASIS-2017) with the aim of raising awareness on migration and increasing solidarity among European citizens. During the entire day, several topics based on migration, integration, and migrants’ rights were presented. For example, Dr. Stefanos Spaneas of University of Nicosia, Cyprus, gave a speech on European regulations and laws from an historical perspective. It was interesting to see how European law is developing to ameliorate the situation of migrants and refugees; however, as Dr. Spaneas argued, the asylum and migration policy is still far to be implemented in favor of a regular and legal migration. 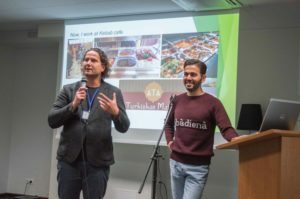 Then Dr. Stefanos Spaneas left the podium to another EURSOL partner, Nathan James Ward of Diagrama Foundation, UK, who shared his idea of migration compared to English birds’ migration with the colleagues of Vilnius. 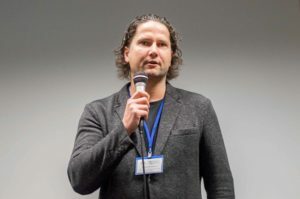 Moving on, the Associate Professor, Dr. Thomas Butvilas of the Vilnius Business College, Vilnius, introduced his topic on children who are left behind. He stressed the importance of assisting and supporting children during stressful and painful moments that may occur in their lives. Cases of abandonment and physical or psychological violence, are typical of unaccompanied migrant minors. These minors are usually sent or sold by their parents to leave their country of origin to have a better future. However, reality does not always meet the expectations. The intentions might be good, but the acts leave a lot of wounds. The second part of the morning session was more focused on social inclusion and innovative actions. For example, Egle Dosiene presented an NGO, Blessed Jurgis Matulatis Social Center. She explained the social activities, most of them cleaning activities, that she and a group of young people lead in a neighborhood of Vilnius, in order to have an active population and more sensitive to the migration issue. Moreover, Vaidesvarans Sundars of School of Business Administration Turiba, Latvia, presented the program Erasmus Plus to show how diversity is important in an educational environment. After a typical Lithuanian lunch at Amberton Hotel, the discussion continued focusing on labor market and its challenges. Kristina Kovaite, for instance, started by pointing out that often migrants are seen as the ones who steal jobs in the host countries. She offered an alternative vision arguing that labor market will change because of the Industry 4.0. In other words, she claimed that artificial intelligence will be the real threat. The panel discussion ended with two testimonies of two young men, Nanko Nikolai Todorov from Bulgaria, and, Elvin Jafarov from Azerbaijan, who shared their successful lives in Vilnius. Mr. Todorov owns his company of children’s clothing and Mr. Jafarov has his own Kebab and cafeteria. Gathering speakers and participants from fourteen countries, it was possible to have a diverse discussion and dialogue on EU integration and migrants’ rights. The UNESCO Chair being present to this discussion continues to pursue its mission of cooperation and global ethics increasing its sense of dialogue and investigation on human rights, multiculturalism, interreligious dialogue, and technology. 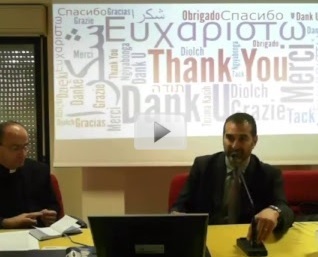 Moreover, the UNESCO Chair representatives had the possibility to share with the other partners the program of their EUROSOL event that will be held on 27th of November in Rome. The Neurobioethics Research Group (GdN), during its latest meeting on May 26, hosted an interdisciplinary seminar about hypnosis, focusing on Milton H. Erickson’s method, father of modern hypnotherapy. The meeting was conducted by prof. Massimo Cotroneo, psychotherapist, and proposed a panoramic overview on techniques, starting from the common p.o.v. to its therapeutic application as recent subject matter of neurosciences’ research. It has been an interesting meeting, the one proposed by the Neurobioethics Research Group (GdN) at the Ateneo Pontificio Regina Apostolorum (APRA), in partnership with the “UNESCO Chair of Bioethics and Human Rights” and the “Science and Faith Institute”, entitled “Hypnosis and Ericksonian Psychotherapy: from clinical medicine to neurosciences”; it focused on hypnosis, covering a brief historical panoramic overview, starting from practice (between esoteric cult and cliche) to clinical medicine, in its recent academic validation. The seminar was conducted by Dr. Massimo Cotroneo, AIDoPS former president, professor at Università Europea di Roma (UER), clinical psychologist and psychotherapist, specialized on Clinical Hypnosis and Ericksonian Psychotherapy, who earned a PhD on neurosciences, focusing on neuronal plasticity. Prof. Father Alberto Carrara, director of GdN and UNESCO Chair’s fellow, was the moderator. Hypnosis, from Greek hýpnos “drowsiness”, is a term referred to a particular state of consciousness, related to the intermediate condition between sleep and wakefulness. What we could see today is the appreciation of hypnosis, thanks to its arrival in the neuroscientific researches as therapeutic phenomenon, therefore as clinical application of a technique. From a scientific point of view, just from the beginning of 1900’s neurosciences started the clarification of the neurophysiological processes within hypnosis, debunking its mysteries, as a tribal-magic ritual, related to its application as an healing attempt of complex diseases, obtainable through altered state of consciousness focused on pain and autosuggestion. It has been a gradual process, which started from the stance of hypnosis as an occult technique, leading to the scientific investigation (permitted by modern diagnostic tools as EEG and fRMI) of cerebral modifications activated within the therapeutic session, where the patient is lead into an altered mental state (trance) by an external agent (therapist). Hypnosis experienced periods of trust and skepticism: turnover which lead to experimental approaches, which gained a sort of stability (still in gradual evolution) with Milton H. Erickson. So Professor Cotroneo introduce us to Ericksonian hypnotherapy, one of the most accredited techniques today by clinical routine. The father of modern hypnosis conferred, through its theories (originated from its personal pain), a revolutionary turn to classical application of hypnotic trance, founded on a substantial “natural” approach to the patient’s altered state of consciousness, focusing on the uniqueness of the active subject, as well as on the compliance on a collaborative work between therapist and patient. Erickson talks about a “natural trance” as condition of common awareness, daily attainable, in contexts different from the clinical one, by everybody; contexts in which you can be particularly absorbed and disconnected from external reality, because of the maximal focus of your concentration on a thought, stimulated by different and temporary agents. What the Ericksonian theory brings us as an essential innovation is the qualitative depth of the therapeutic alliance as guarantee of the therapy’s benefit: preparing a context made of symmetry and elasticity, adaptable to the patient’s specificity, circled by an heterogeneous and unpredictable ground. The attention addressed to the communicating parts’ synergy is the strong point of modern hypnosis which, differently from its classical setting, supports a sort of comprehensive entourage of the person, whose difficulties are entrusted to the therapist, lowering the intimate protective defenses. Vice versa, before this “spontaneous” mark, the psychotherapy’s session blocked subject’s self-exploration, following the idea of a conditional difference between who holds the action “power” (therapist) and who must submit, so avoiding any patient’s possibility to lead the session. Massimo Cotroneo marked, in this sense, the peculiarity of inner-outer contact, habit of a communicative approach which, in trance condition, allows the patient to conduct a deepened work on himself; the patient, according to Ericksonian theory, is already owner of what is necessary to manage different situations, even if during the session he’s unconsciously guided to disassociative conditions. Hypnotherapy’s aim is to be able to lead the patient to reach the most hostile spots of his subconscious, rather the places where he’s not able by himself to arrive at: meanwhile traditional hypnosis focused its techniques on autosuggestion, addressing indiscriminate subjects, the ericksonian methods focus on the individual, highlighting the preparatory ability of the stage prior the trance condition (including verbal communication, non-verbal communication, behaviors, reactions); a “sowing” and “dissemination” moment which channels the person to his problems. Hypnosis is currently a highly plastic practice, exploited and exploitable in various fields, from the oriental/meditative to sport, until what stands at the therapeutic boundary, as dependencies, food problem, psychic conflicts, reaching anesthetic support to surgery in the end. Entered as neurosciences’ proper aim of the study, and consequently in clinical practice, hypnosis asks, as equal as other therapeutic modalities, to shed light on its relative bioethical issues. We must establish a sort of precautionary principle, especially regarding public reactions to hypnosis: as the professor emphasized during the seminar, historical roots of the hypnotic method are distant, both in time and in the technique’s contextual and constitutive nature; its incorporation as neuroscientific analysis is extremely recent instead, so potential patients risk a danger of an informational vacuum (often cause of strong perplexities) about the session they submit to. It’s common interest to strive in order that a rigorous and scientifically based interpretation of the technique is available to everyone, if it’s used with a therapeutic purpose in suitable places for this type of care path. 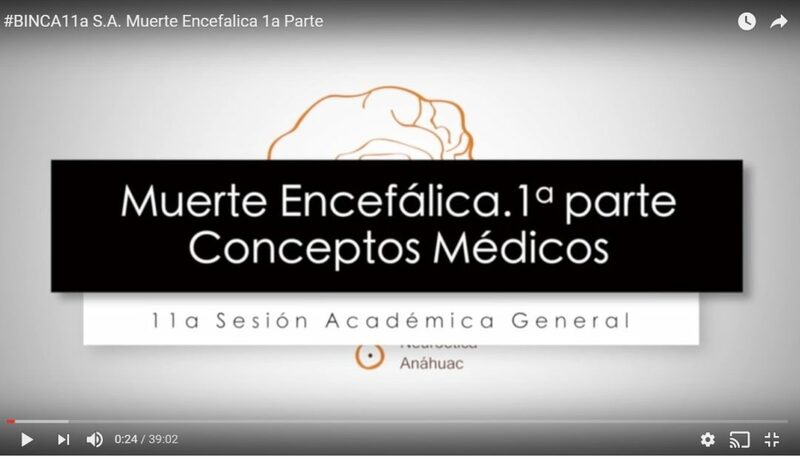 Consistently with the mission of the UNESCO Chair in Bioethics and Human Rights, the systematic confrontation between experts contributes to a greater issue’s specification, so that the principles at stake can be safeguarded for the advantage, respect and dignity of the person. In this sense it will be essential to outline and transmit to the patients a vademecum that protects their integrity and privacy, whose control, in altered consciousness situations where the person concerned‘s exclusive property partially fails, is exposed and vulnerable. This is indispensable in order to stem a possible (improper) manipulation, conducted by the therapist (or the one who abusively self-certifies himself as therapist); manipulation that hampers free help demand. As raised at the end of the meeting, uncertain perspectives on the (long-term) consequences and the hypothesis of a future (if not experienced) use of hypnosis to enhance “standard” cognitive abilities are questions that reaffirm the necessity for an academic detailed study. On the other hand, a guided, scientific, and ethically correct use of this technique would be adequate to generate benefits even beyond the pure clinical place, such as for criminological investigations. Considering, furthermore, the safeguard of religious freedom, which may be uncomfortable with hypnotic practice in some worships, it’s even more prudent to have an informed consent to care, where there’s the best possible awareness that trance induction, as well as the driven self-reflection that follows the trance induction, are objective data, in order to overcome contrasts related to other spheres of application of hypnosis. The ever-evolving investigation and the benefits disclosed until today by scientific publishing let well hope that this technique, in particular in the modern ericksonian model, can offer additional help windows to the traditional psychotherapeutic practice, thanks also to the in-depth analysis provided by neurosciences. 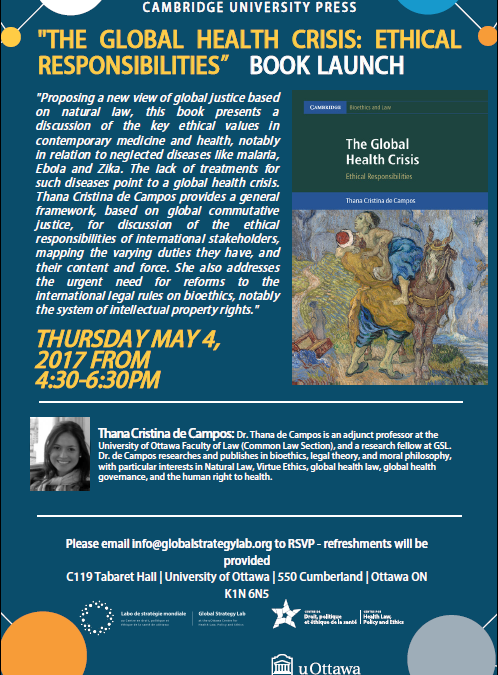 UNESCO Chair Research Scholar Thana Cristina de Campos will release her new work The Global Health Crisis: Ethical Responsibilities on May 4, 2017 at the University of Ottawa. Below is a summary of the work from the Cambridge University Press. Click here to download the book launch flyer. Proposing a new view of global justice based on natural law, this book presents a discussion of the key ethical values in contemporary medicine and health, notably in relation to neglected diseases like malaria, Ebola and Zika. The lack of treatments for such diseases point to a global health crisis. Thana Cristina de Campos provides a general framework, based on global commutative justice, for discussion of the ethical responsibilities of international stakeholders, mapping the varying duties they have, and their content and force. She also addresses the urgent need for reforms to the international legal rules on bioethics, notably the system of intellectual property rights. These ideas will be of interest to those who are looking for a more nuanced view of the human right to health than that provided by advocates in the globalist mainstream. Introduction; Part I. Defining the Object: What Is a Reasonable Scope and Content for the Human Right to Health? : 1. The moral value of health: health as a basic human need; 2. The human right to health and its corresponding responsibilities; Part II. Defining the Subjects: Who Are the Duty-Bearers of the Right to Health? : 3. States and natural persons as subjects of justice; 4. Pharmaceutical transnational corporations as subjects of justice; Part III. Defining Just Institutions: How Should Right to Health Responsibilities Be Allocated among the Subjects of Justice? : 5. The global health governance of the global health crisis; Conclusion. Download Cambridge University Press information here. The Research Group of Neurobioethics dedicated its February 24 meeting to planning for the the March 16, 2017 sixth session of Brain Awareness Week, promoted by Dana Foundation, entitled “Neuroethics: Remapping the Field”. The event provides a space for reflecting on the historic context and various meanings of the neologism “neuroethics.” In addition, the event offers an exploration of the new field of the neuroesthetics. The conference helps participants renew their reflection on what makes us specifically human, in the light of non-reductive neurosciences. The Neurobioethics Research Group (GdN), chaired by the its director Alberto Carrara, hosted its latest meeting on February 24 at the Ateneo Pontificio Regina Apostolorum (APRA) in Rome. The meeting was dedicated to the upcoming March 16 sixth session of the Brain Awareness Week entitled “Neuroethics: Remapping the Field”, in honour of the 15th anniversary of the birth of Neuroethics. 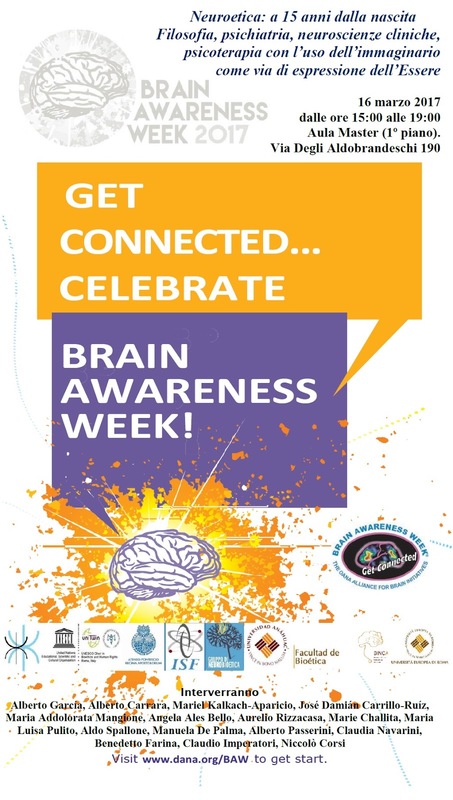 During the meeting, participants discussed the path paved by the first five Brain Awareness Weeks (BAW), coordinated and promoted by Dana Foundation (in particular by the European Dana Alliance for the Brain, by the Dana Alliance for the Brain Initiatives and by the Society for Neuroscience in the United States). The weeks began in 2012 at APRA and at the European University of Rome, by means of the GdN in collaboration with S.I.S.P.I. (International School of Specialization with the Imaginative Procedure), the UNESCO Chair of Bioethics and Human Rights and the Science and Faith Institute. 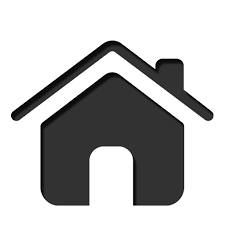 The meeting summarized the arguments debated during previous five BAWs. The 2012 “Conscience, between mind and brain” analyzed the interrelation between conscience, mind and brain, deepened in its philosophical concept, in its influence in bioethics, in its clinical and psychodynamic role. The 2013 “Neuroeconomics and neuromarketing” paid particular attention to social ethics, to the decision-making and satisfaction procedures, and the pathological influences upon the number of suicides. The 2014 “Memory and Alzheimer” reflected on the mnemonic element, looked at neuroimaging techniques and neurophysiology, and analyzed how Alzheimer’s disease affected patients’ care. The diverse scientific reflections referred to the anthropological-philosophical perspective, thus extending the themes to issues of conscience, freedom and identity. The latter faces new threats like the “oblivion pill”, a drug that purposes to remove some memory data from minds. 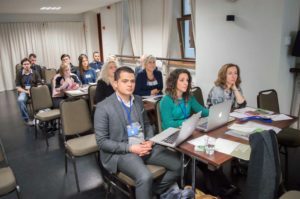 The 2015 “Neuro-Law” session examined the interrelation between the judicial field (as illustrated by Alberto Garcia, lawyer and director of the UNESCO Desk of Bioethics and Human Rights) and the psychiatric, psychological, and pathological conditions of patients. In particular, participants reflected on the case of a cerebral tumor linked to personality disorders (affecting patient’s will, deliberateness and vulnerability). Finally, the 2016 “Neuroesthetics” session applied an interdisciplinary approach to questions of the beauty and brain’s aesthetic perception, starting from the idea that «creativity is the strategy brain uses to compensate its own limits». 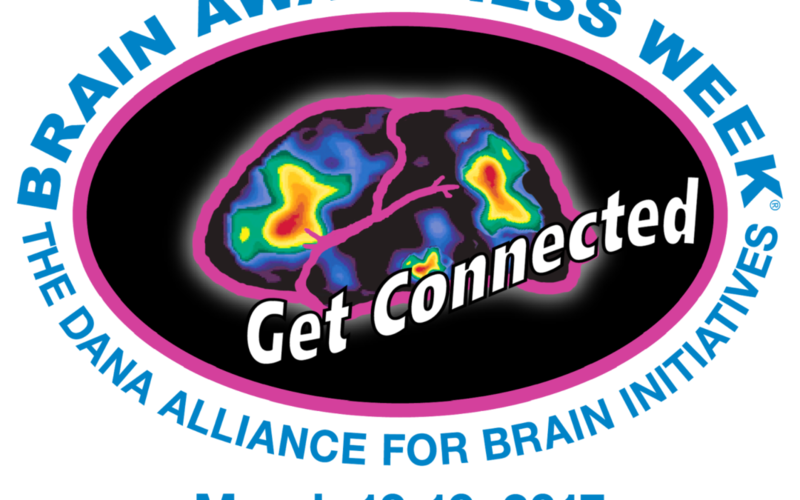 BAW is an initiative begun in San Francisco, California in 2002, where the Dana Foundation organized the first neuroethics world congress entitled “Neuroethics: mapping the field,” thus giving the neologism its “canonical birth”. The definition of “Neuroethics” is attributed to the American political scientist William Safire, who defined neuroethics as «the investigation of what is correct or incorrect, good or bad, about the human brain’s treatment, enhancement, interventions or manipulations». BAW’s purpose is to attract interest to this fascinating, powerful and mysterious organ known as the brain. Moreover, its aim is to produce educational diffusion about the nervous system and its effects on who we are. It also seeks to provide, at the media level, a greater awareness about neuroscience research’s status and, more broadly, about neuroscientific knowledge. The March 16 session will focus on: neuroethics’ proper identity, comparing different definitions so as to generate a better comprehension; the perspectives of neuroesthetics’ and their innovative applications; the historical background of what we commonly define today as “neutoethics,” referring to the common William Safire’s quote mentioned above, its origins in 1973 on account of professor Anneliese Alma Pontius. These interdisciplinary spaces promote a sense of responsibility, not only for inquiring scientists, but also for any citizen, in order that he collaborate in the social good. Such educational activities are constant and gradual works, never completely done, of perfecting critical ability in the face of technological possibilities whose rapid and unceasing developments pose anthropological and ethical challenges. Neuro-centrism, assumed in its strongest meaning, is the product of a new “Brain Era”, that replaces the decayed “Anthropocentric Era.” We can thus see the nexus with the UNESCO Chair’s mission and its commitment of distinguishing fair from unfair, just from unjust in the face of scientific challenges and of making respect for human rights and human freedom fundamental. As it has been for bioethics’ origins, neurosciences need a double intervention, both on an specialized expert professional level and on an ethical-juridical level capable of promoting the common good for humanity. As it has been demonstrated reviewing the previous session history, neurosciences have utilized the interdisciplinary approach to answer the ethical demand for a «homeostatic process», aware that each scientific progress raises questions around freedom, conscience, life, human being, deliberateness. The UNESCO Chair seeks to examine human identity, overcoming the risk of separation between «he who studies» and «what is studied», patient and pathology, the objective-subjective. Side by side with the therapeutic perspective, potentially alarming horizons are rising, established by the neuroscientific possibilities open to discriminatory and selective tendencies, clearly in contrast with the bioethical values to which the Universal Declaration on Bioethics and Human Rights refers. For example the challenge of human enhancement, with its social repercussions and the danger of social inequality, along with the consumer trivialization of the biotechnological potential. Dialogue is therefore essential for the sake of constructive growth in a science that is altruistic and not an end in of itself at the disadvantage of certain individuals. The patrimony left by neurosciences is of a host of social and existential questions without full resolution. On the one hand, there is the dreadful possibility of overstepping what is naturally human in order to enter the «biotechnological symbiont», where the epiphanic character of the body transforms the naturally human into the «naturally artificial».